A team of scientists led by the Max Planck Institute for Solar System Research (MPS) and the University of Göttingen has discovered new waves of vorticity on the Sun. 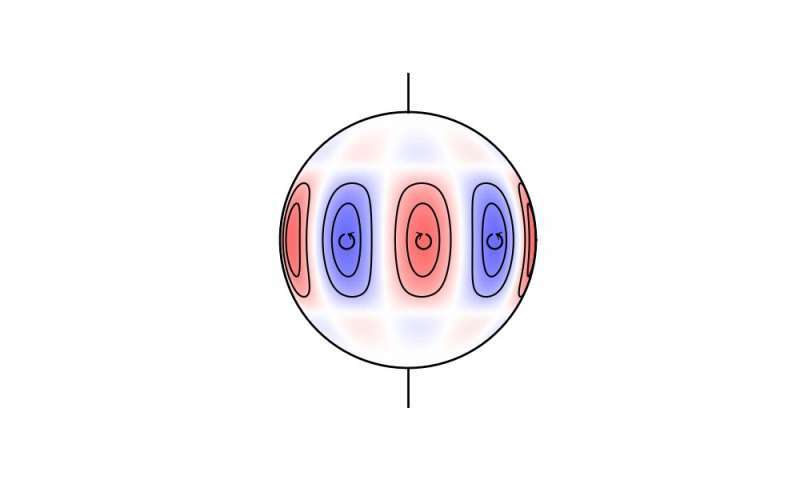 As described in today's issue of Nature Astronomy, these Rossby waves propagate in the direction opposite to rotation, have lifetimes of several months, and maximum amplitudes at the Sun's equator. For forty years scientists had speculated about the existence of such waves on the Sun, which should be present in every rotating fluid system. Now, they have been unambiguously detected and characterized for the first time. The solar Rossby waves are close relatives of the Rossby waves known to occur in the Earth's atmosphere and oceans. In almost every weather map of the Earth's northern hemisphere atmospheric Rossby waves are a prominent feature. They appear as meanders in the jet stream separating cold polar air in the north from warmer subtropical air farther to the south. Sometimes these waves reach the equatorial regions and can even affect weather in Australia. In principle, waves of this type (often referred to as planetary waves) arise on every rotating sphere due to the Coriolis force. Saturn's hexagon, a stable cloud pattern at the planet's north pole, may also be an expression of these waves. The existence of Rossby waves in stars was predicted about forty years ago. "Solar Rossby waves have very small amplitudes and periods of several months, thus they are extremely difficult to detect", says Prof. Dr. Laurent Gizon, coordinator of the team that made the discovery and director at the MPS. The study required high-precision observations of the Sun over many years. The scientists from MPS analyzed a six-year dataset from the Heliospheric and Magnetic Imager (HMI) onboard NASA's Solar Dynamics Observatory (SDO), in operation since 2010. "The HMI images have sufficiently high spatial resolution to allow us to follow the movement of photospheric granules on the Sun's visible surface", says Dr. Björn Löptien, scientist at the MPS and first author of the article. These granules are small convective cells that are roughly 1500 kilometers in size on the solar surface. In their new study, the researchers used the granules as passive tracers to uncover the underlying, much larger vortex flows associated with the Rossby waves. In addition, methods of helioseismology were used to confirm the discovery and to study the Rossby waves in the solar interior at depths up to 20000 kilometers. "All in all, we find large-scale waves of vorticity on the Sun that move in the direction opposite to rotation. That these waves are only seen in the equatorial regions is completely unexpected", Gizon explains. The vorticity patterns are stable for several months. The researchers were able to determine the relationship between the waves' frequency and wavelength for the first time – thus clearly identifying them as Rossby waves. 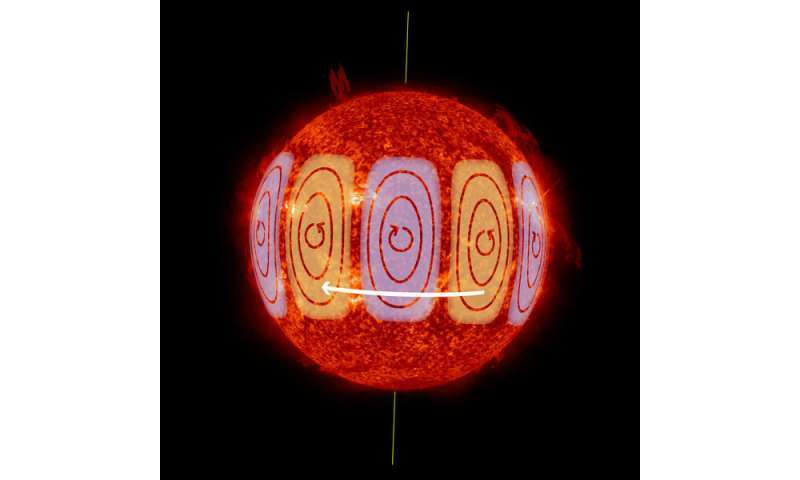 "Solar Rossby waves are gigantic in size, with wavelengths comparable to the solar radius", Gizon explains. They are an essential component of the Sun's internal dynamics because they contribute half of the Sun's large-scale kinetic energy.